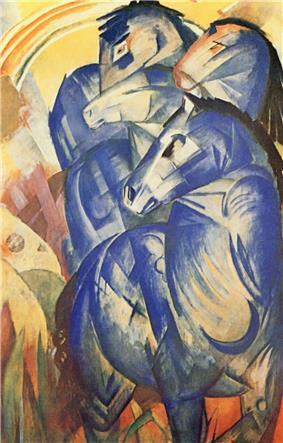 Der Blaue Reiter (The Blue Rider) was a group of artists united in rejection of the Neue Künstlervereinigung München in Munich, Germany. The group was founded by a number of Russian emigrants, including Wassily Kandinsky, Alexej von Jawlensky, Marianne von Werefkin, and native German artists, such as Franz Marc, August Macke and Gabriele Münter. They considered that the principles of the Neue Künstlervereinigung München, a group Kandinsky had founded in 1909, had become too strict and traditional. Der Blaue Reiter was a movement lasting from 1911 to 1914, fundamental to Expressionism, along with Die Brücke which was founded in 1905. Wassily Kandinsky, Franz Marc, August Macke, Alexej von Jawlensky, Marianne von Werefkin, Gabriele Münter, Lyonel Feininger, Albert Bloch and others formed the group in response to the rejection of Kandinsky's painting Last Judgment from an exhibition. 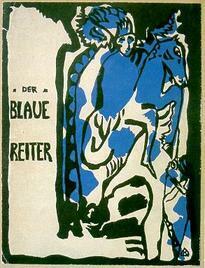 Der Blaue Reiter lacked an artistic manifesto, but it was centered around Kandinsky and Marc. Paul Klee was also involved. The name of the movement is the title of a painting that Kandinsky created in 1903, but it is unclear whether it is the origin of the name of the movement, as Professor Klaus Lankheit learned that the title of the painting had been overwritten. Kandinsky wrote 20 years later that the name is derived from Marc's enthusiasm for horses and Kandinsky's love of riders, combined with a shared love of the colour blue. For Kandinsky, blue is the colour of spirituality: the darker the blue, the more it awakens human desire for the eternal (see his 1911 book On the Spiritual in Art). Within the group, artistic approaches and aims varied from artist to artist; however, the artists shared a common desire to express spiritual truths through their art. They believed in the promotion of modern art; the connection between visual art and music; the spiritual and symbolic associations of colour; and a spontaneous, intuitive approach to painting. Members were interested in European medieval art and primitivism, as well as the contemporary, non-figurative art scene in France. As a result of their encounters with cubist, fauvist and Rayonist ideas, they moved towards abstraction. Der Blaue Reiter organized exhibitions in 1911 and 1912 that toured Germany. They also published an almanac featuring contemporary, primitive and folk art, along with children's paintings. In 1913 they exhibited in the first German Herbstsalon. The group was disrupted by the outbreak of the First World War in 1914. 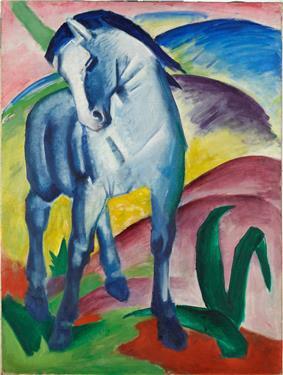 Franz Marc and August Macke were killed in combat. Wassily Kandinsky, Marianne von Werefkin and Alexej von Jawlensky were forced to move back to Russia because of their Russian citizenship. There were also differences in opinion within the group. As a result, Der Blaue Reiter was short-lived, lasting for only three years from 1911 to 1914. Supported by their dealer Galka Scheyer, Kandinsky, Feininger, Klee and Alexej von Jawlensky formed Die Blaue Vier (the Blue Four) group in 1923. Together they exhibited and lectured together in the United States from 1924 on. An extensive collection of paintings by Der Blaue Reiter is exhibited in the Städtische Galerie in the Lenbachhaus in Munich. 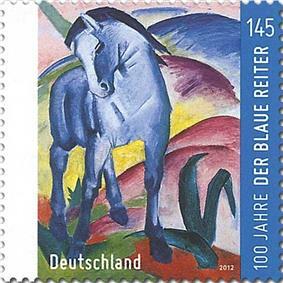 Conceived in June 1911, Der Blaue Reiter Almanach (The Blue Rider Almanac) was published in early 1912, by Piper, Munich, in an edition of 1100 copies; on 11 May, Franz Marc received a first print. The volume was edited by Kandinsky and Marc; its costs were underwritten by the industrialist and art collector Bernhard Koehler, a relative of Macke. It contained reproductions of more than 140 artworks, and 14 major articles. A second volume was planned, but the start of World War I prevented it. Instead, a second edition of the original was printed in 1914, again by Piper. Arnold Schoenberg's article "The Relationship to the Text", and a facsimile of his song "Herzgewächse"
Thomas de Hartmann's essay "Anarchy in Music"
Kandinsky's essay "On the Question of Form"
The art reproduced in the Almanac marked a dramatic turn away from a Eurocentric and conventional orientation. The selection was dominated by primitive, folk, and children's art, with pieces from the South Pacific and Africa, Japanese drawings, medieval German woodcuts and sculpture, Egyptian puppets, Russian folk art, and Bavarian religious art painted on glass. The five works by Van Gogh, Cézanne, and Gauguin were outnumbered by seven from Henri Rousseau and thirteen from child artists. December 18, 1911, the "First exhibition of the editorial board of Der Blaue Reiter" (Erste Ausstellung der Redaktion Der Blaue Reiter) opened at the Heinrich Thannhauser's Moderne Galerie in Munich, running through the first days of 1912. 43 works by 14 artists were shown: paintings by Henri Rousseau, Albert Bloch, David Burliuk, Wladimir Burliuk, Heinrich Campendonk, Robert Delaunay, Elisabeth Epstein, Eugen von Kahler, Wassily Kandinsky, August Macke, Franz Marc, Gabriele Münter, Jean Bloé Niestlé and Arnold Schönberg, and an illustrated catalogue edited. From January 1912 through July 1914, the exhibition toured Europe with venues in Cologne, Berlin, Bremen, Hagen, Frankfurt, Hamburg, Budapest, Oslo, Helsinki, Trondheim and Göteborg. February 12 through April 2, 1912, the "Second exhibition of the editorial board of Der Blaue Reiter" showed works in "Black & White" (Zweite Ausstellung der Redaktion Der Blaue Reiter, Schwarz-Weiß) at the "New Art" Gallery of Hans Goltz (Neue Kunst Hans Goltz) in Munich. ^ Peter Nicholls, Modernisms: A Literary Guide, Berkeley, CA, University of California Press, 1995; p. 141. ^ George Heard Hamilton, Painting and Sculpture in Europe, 1880–1940, New Haven, CT, Yale University Press, 1993; pp. 215-16. ^ Catalogue, reproduced in Hoberg & Friedel (1999), pp. 364-365. Shearer West (1996). The Bullfinch Guide to Art. UK: Bloomsbury Publishing. Vezin, Annette; Vezin, Luc (1992). 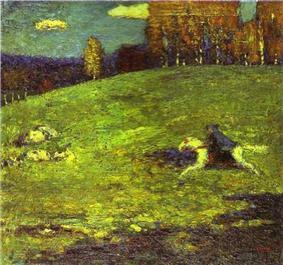 Kandinsky and the Blue Rider. Terrail.